Around 850 oncology and therapeutics clinical trials are conducted in Malaysia per year to improve patient survival, said Health Ministry (research and technical support) deputy director-general, Datuk Dr Shahnaz Murad. The new and ongoing studies are being conducted by Clinical Research Malaysia (CRM), a non-profit organisation started in 2012 by the Health Ministry to bring in future medicine for the prevention, diagnosis and treatment of disease. Dr Shahnaz told reporters this after officiating the 2nd National Cancer Institute (IKN) Research Day and Clinical Trials Day 2018 yesterday. “The purpose of having CRM is to help the Health Ministry venture into new research, such as industry-sponsored research, to bring in future medicine. “This allows us to treat and give patients treatment options especially after they’ve exhausted standard therapy. As such, a more hopeful future is offered by providing speedy and reliable treatment, especially to cancer patients. Here is something new with the possibility to participate in a trial, she added. According to CRM chief executive officer, Dr Akhmal Yusof, IKN together with researchers and oncologist from Sabah, Sarawak, Kuala Lumpur and Penang, are conducting clinical research which includes 20 to 25 trial studies on oncology and cancer treatment. Each study, depending on its progression or survival, will take between two and five years to complete. “This is considered a lot of studies which will bring plenty of benefits to patients. Those who respond well will probably be free from disease progression and have a better quality of life,” he said. At the event which was held in the IKN auditorium, Dr Shahnaz presented the Contract Research Organisation of the Year Award to IQVIA Malaysia, TOP Recruiter Award to Dr Shereen Ch’ng Suyin (Hospital Selayang) and Dr Wong Yoke Fui (IKN), the Investigator of the Year Award to Dr Voon Pei Jye (Sarawak General Hospital) and Clinical Trial Site of the Year Award to IKN. The ‘I Am Aware’ campaign was launched at the same time. It is a public educational programme on the benefits and risks of participation in clinical trials. 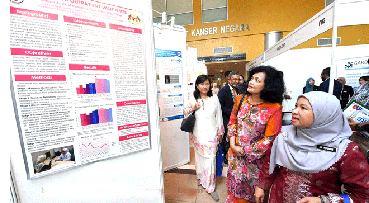 A roadshow is among the activities being organised with stops at public clinics and hospitals around Malaysia.